This week, Fiction Daily will take a look at some of the highlights of Jack Kerouac’s life as seen through the exhibit, Beatific Soul: Jack Kerouac on the Road, at the New York Public Library. We think of Kerouac as a detailed, even fussy writer at times, but he was in fact very athletic and enjoyed the outdoors, as you can see from his time spent hiking and sleeping outdoors. In high school he was a football hero and earned a football scholarship to Columbia University, though he left the university when he found it too constrictive. 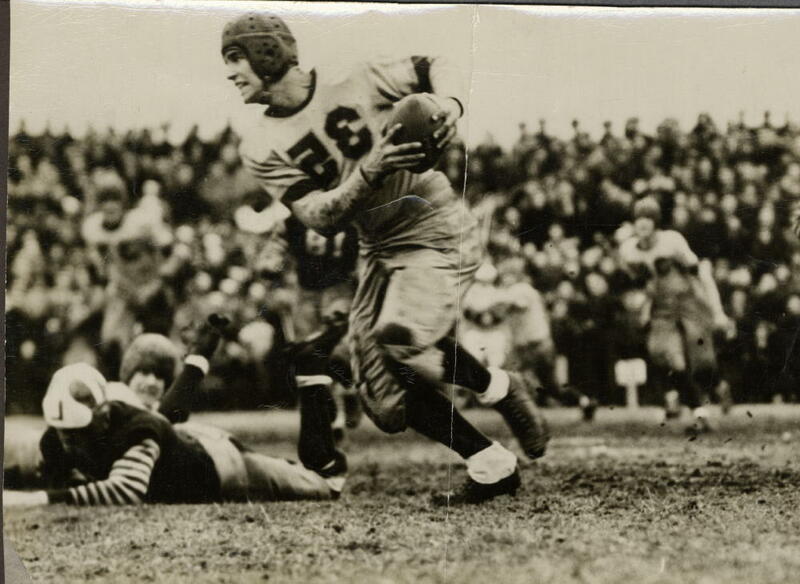 Photo: Jack Kerouac scoring a touchdown against Lawrence High School. Gelatin silver print (developed in reverse), 1939. NYPL, Berg Collection, Jack Kerouac Archive. Reproduced courtesy of John G. Sampas, legal representative of the estates of Jack and Stella Kerouac. This entry was posted on February 25, 2008 at 4:24 am and is filed under Uncategorized. You can follow any responses to this entry through the RSS 2.0 feed. You can leave a response, or trackback from your own site.